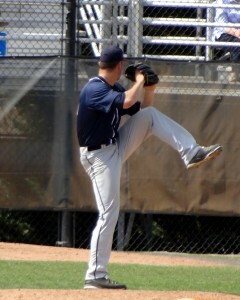 Question: I was a collegiate pitcher and have a shot at the majors in the spring. I started training again and we have done a couple of workout series that included snatches for time and another day was a series of cleans and dips for sets of 15 each, 9 each and then 6 of each. What else should I be considering for training? Answer: That’s a broad question. First, reconsider what you have done. The routines your described are classic types of Crossfit which, if your goal is to burn calories and general conditioning, is the strong suit of that style of training. It doesn’t mean the method you’re using for training isn’t effective for what it is capable of doing but it’s not going to carry over well to pitching a baseball. The movements are full body exercises that expend a ton of calories. Be aware of your wrists(carpal ligament) and elbows when performing cleans, also the rotator cuff takes a beating from snatches. Protecting those areas is key for baseball players. Work specifically to strengthen your core muscles and work to improve your range of motion along with flexibility in your hips and trunk. Choose exercises like hanging knee raises combined with Russian twists and finish with an upper ab exercise. Strengthen your hip flexors with focused band exercises, such as, knee drivers and clams. Place more emphasis on posterior movement exercises especially your hamstrings. Sliders are great for those. Once you have completed your training exercises spend,at least, five minutes on flexibility in your Achilles’ tendon, calf, hamstrings, hip flexors and IT band. Train your forearms both for grip and rotation. Use training bands for what we call 3D shoulders which is a series of exercises to work all three heads of the shoulder in sequence. These exercises are specifically helpful in deceleration training for pitchers, which as they strengthen the area, protects the rotator cuff and also helps to protect the ulner collateral ligament. Be specific and purposeful in your approach to training. It’s your career so ask how does your training help you reach/exceed your goals? Make your big league dreams happen.